Vintage French chandelier with three tiers of glass prisms. Newly wired for use within the USA. Includes chain and a canopy. Ready to be installed. 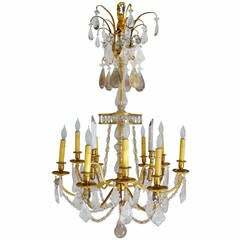 Excellent French carved giltwood 6-light chandelier. 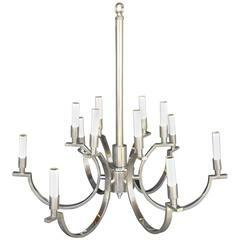 A French circa 1930s crystal chandelier with four lights. Gilt body covered with crystal rosettes. Measurements: Height 28" min. drop, 32" current drop Diameter 22".